Torque-Arm Watts Link g-Link 68-72 Chevelle GM A-Body Rear Coil-Over Suspension System, Includes Watts Link, Adjustable Pivot-Ball Style Lower Control Arms, Adjustable Torque Arm, Adjustable Billet Shock Mounts and VariShock Coil-Overs. 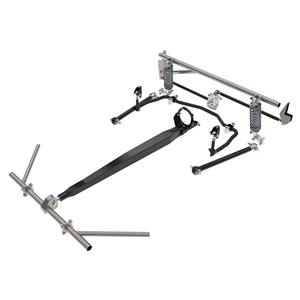 Options for Front Slider Pivot Type, Control Arm, Front Crossmember, Shock Valving and Spring Rate, Air Spring, Axle Housing Mounts and Anti-roll Bar. NOTE: Not For Use With 10 or 12 Bolt Chevy Housings.